Where you start in life affects where you get—educationally and economically—in a big way. 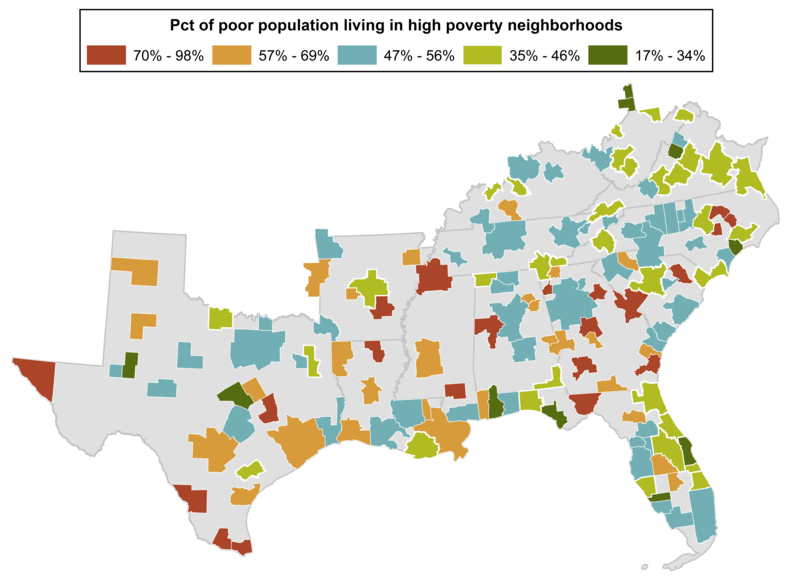 In sprawling metros of the South, residential segregation influences school quality, housing options, and transportation, and a disconnect often exists between low- and moderate-income neighborhoods and the location of good jobs. Economic segregation is deeply intertwined with racial segregation in the South, so the impact of this geographic divide disproportionately affects people of color. An Equality of Opportunity Project study on the geography of economic mobility found that areas with low mobility tend to have high levels of residential economic segregation, and last week, the Martin Prosperity Institute released a report on residential economic segregation in U.S. metros. They found that economic segregation is generally higher in big, dense cities, and it’s also higher in knowledge economies. In these cities, there are rarely pathways for workers to move into high-wage jobs, and residential segregation by educational level and occupation worsens social isolation. Physical and geographic distance makes it harder for people to identify job openings and training opportunities; with this information gap, it’s even hard to figure out what skills are required for those jobs. Job requirements change rapidly, especially in high-tech and knowledge economies, making it especially important for young people to be connected to social networks with information about emerging skill requirements—and opportunities to develop them. Map produced by Scott Edmonds using 2008-2012 data from the U.S. Census Bureau’s American Community Survey. High poverty neighborhoods are defined as neighborhoods where 20 percent or more of residents are below the poverty line. Concentrated poverty has powerful consequences, especially in those areas with weak transportation infrastructure. Our region has historically under-invested in public transportation, and rapidly growing Southern cities are some of the most difficult for low-income people to move around in affordably. It’s not just poverty that gets concentrated. This segregation means that wealth is concentrated in certain neighborhoods (hint: mostly white neighborhoods) and because tax bases are so varied, segregation causes dramatic differences in resource allocation for public services, particularly public schools. The percent of students living in poverty in a school vary widely even within districts. High poverty schools are the most likely to be academically under-performing. This leads to the creation of parallel social networks and opportunity systems with little to connect them (remember that information gap I mentioned earlier?). And that means economic mobility will remain low, compounding the wealth concentration problem. It’s time to diversify our neighborhoods and networks, and to consider how and why our investment in the success of the next generation varies so widely by neighborhood, race, and class.